Textport is the dialog box in which commands can entered manually. There are two scripting languages in TouchDesigner: Python and Tscript. For Tscript, all commands are described in Tscript Commands and Tscript Expressions, and its scripting syntax is found in Tscript. Dialogs -> Textport brings up the main textport, but you can also put textports in panes by setting the Pane Type menu to Textport and DATs. textport is a Tscript command that can be used to manipulate the contents of the dialog. The textport can be opened from the Dialogs menu or by using the Alt+Shift+T keyboard shortcut. 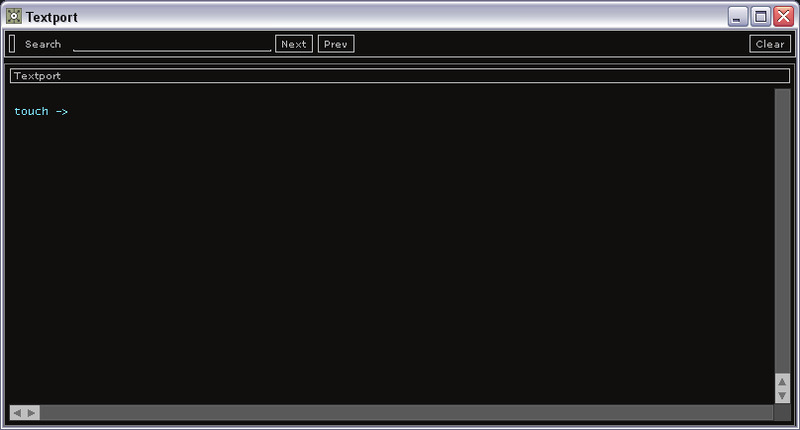 Textport can also be opened as a Pane. Run DAT - paste the command to execute the DAT as a script into the Textport. This option is only available in the main Textport tab. Open DAT - open the contents of the DAT in a new tab in the Textport. You can switch between tabs by clicking on the tab header near the top of the dialog box. Paste Text - pastes in the DAT's path name just like other OPs. Additionally, any selected text can be dragged onto the Textport from anywhere on the interface. A history or recent commands can be brought up by right-clicking anywhere in the textport. Pressing the "up" arrow key will step back through the command history. Pressing the down arrow key will step forward through command history. The search field at the top of the textport can be used to find strings in the scrollable text of the textport. When working with DATs in the textport, a history of viewed DATs will be available on the right side of the Textport header. Holding shift and clicking on textport text will select the text between the cursor and the mouse position instead of just moving the cursor. In the textport, you can enter help for a list of available commands or help(object) for any python object. Script errors and messages from print() commands are also output to this dialog box. The main textport also receives the error messages and print() commands from all scripts that are run in DATs. However startup and system errors are output to Dialogs -> Console. You can save typing OP path names by simply dragging any OP onto the Textport. Just drag the OP onto the Textport using the left mouse button. In the textport, you can enter help for a list of available commands or exhelp for a list of available expression functions. You can also access Tscript commands and expressions from the Help menu by selecting Commands and Expressions. Script errors and messages from echo commands are also output to this dialog box. The main textport also receives the error messages and echo commands from all scripts that are run in DATs. This can be particularly useful while debugging scripts or monitoring network performance. This page was last edited on 29 May 2018, at 18:35.